Heat oven to 350°F (325°F for dark or nonstick pans). Place paper baking cup in each of 20 regular-size muffin cups. In large bowl, beat cake mix, pears, 1/3 cup reserved pear syrup, the oil and egg whites with electric mixer on low speed 30 seconds. Beat on medium speed 2 minutes, scraping bowl occasionally. Divide batter evenly among muffin cups. In medium bowl, beat butter, shortening, vanilla, powdered sugar and 3 tablespoons milk on low speed until well blended. Beat on medium speed, adding more milk if necessary, until fluffy and spreadable. Place 1/3 cup frosting in each of 2 small bowls. Add yellow food color to one bowl and stir to blend; add green food color to other bowl and stir to blend. Frost cupcakes with remaining white frosting. Pipe designs on cupcakes with yellow and green frostings. Decorate as desired with candy sprinkles. With bamboo skewer, poke hole in side of each cupcake. Tie ribbon bow in center of each lollipop stick. Add gumdrop to one end of each stick. 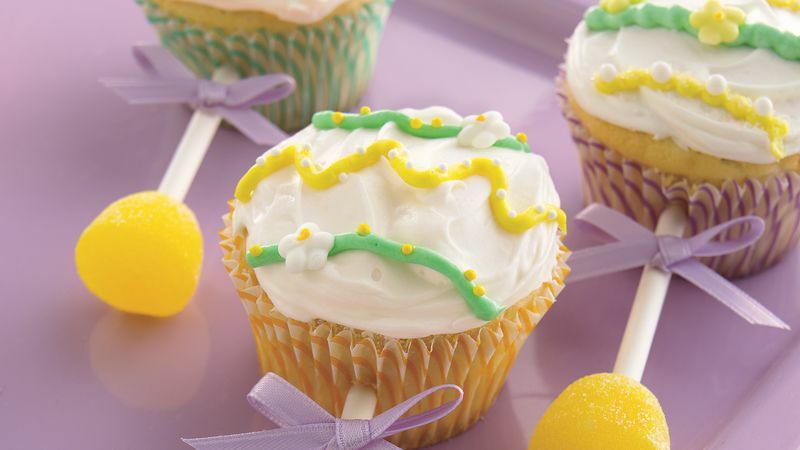 Insert other ends of sticks into sides of cupcakes, just below frosting, to form rattles. Store loosely covered. Use a decorating bag and tips to pipe designs on the cupcakes. Or fill a resealable food-storage plastic bag with frosting, and snip a small opening in one bottom corner of the bag; squeeze bag to pipe the frosting. Lollipop sticks can be purchased online at kitchenkrafts.com.